We present a quasi-Newton sequential quadratic programming (SQP) algorithm for nonlinear programs in which the Hessian of the Lagrangian function is block-diagonal. Problems with this characteristic frequently arise in the context of optimal control; for example, when a direct multiple shooting parametrization is used. In this article, we describe an implementation of a filter line-search SQP method that computes search directions using an active-set quadratic programming (QP) solver. To take advantage of the block-diagonal structure of the Hessian matrix, each block is approximated separately by quasi-Newton updates. For nonconvex instances, that arise, for example, in optimum experimental design control problems, these blocks are often found to be indefinite. In that case, the block-BFGS quasi-Newton update can lead to poor convergence. The novel aspect in this work is the use of SR1 updates in place of BFGS approximations whenever possible. The resulting indefinite QPs necessitate an inertia control mechanism within the sparse Schur-complement factorization that is carried out by the active-set QP solver. This permits an adaptive selection of the Hessian approximation that guarantees sufficient progress towards a stationary point of the problem. 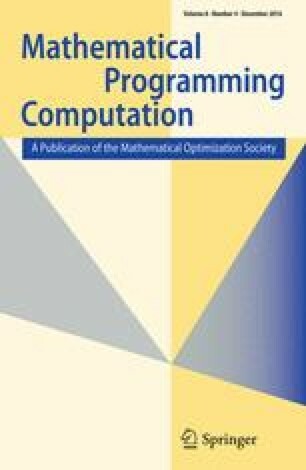 Numerical results demonstrate that the proposed approach reduces the number of SQP iterations and CPU time required for the solution of a set of optimal control problems. The authors thank two anonymous referees and an anonymous technical editor for their constructive and helpful comments. D. Janka and C. Kirches were supported by DFG Graduate School 220 (Heidelberg Graduate School of Mathematical and Computational Methods for the Sciences) funded by the German Excellence Initiative. D. Janka was supported by BASF SE within the junior research group experimental design. C. Kirches and S. Sager were supported by the German Federal Ministry of Education and Research program “Mathematics for Innovations in Industry and Service 2013–2016”, Grant No. 05M2013-GOSSIP. Financial support by the European Union within the 7th Framework Programme under Grant Agreement No 611909 is gratefully acknowledged. A. Wächter was supported in part by the National Science Foundation Grant DMS-1216920. Parts of this work were carried out during an appointment of D. Janka to Northwestern University.